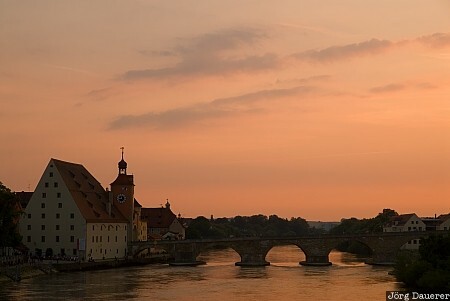 The Stone Bridge (Steinerne Brücke) crossing the Danube river and the Salzstadel at the left side of the bridge in Regensburg in front of a colorful sunset sky Regensburg is the capital of Upper Palatinate (Oberpfalz) in the east of Bavaria, Germany. This photo was taken in the evening of a sunny day in June of 2010. This photo is part of the exhibition Bridges (February 2019). This photo was taken with a digital camera.